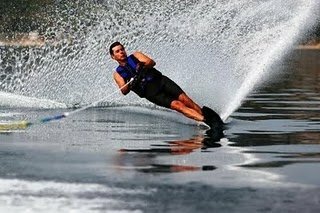 Knee boarding Speed boat is the modern and more adventurous cousin of water skiing. However, the enthusiasts who enjoy the sport will vouch that it is much simpler than water skiing and doesn’t require a skilled technique to begin. The water waves play spoil sport all the time and are in a constant race to run you down. However the need of the hour to hold your own and fight back the waves and use their energy to propel your knee board to glory. Knee boarding is a great fun and the sport is mostly near the beach in Goa. Most famous beach is Vagator, Anjuna, Calangute and many more.